Capitalize on your consumers' aspirations. Blue Apron's mission is to make cooking easy, fun, and accessible, and many of their fans, like @_LAZRBEAK_ appreciate the effort: "Shouts to Blue Apron for teaching me words like shallot and fond and turning me from a mac n cheese/hot sauce amateur into a TOP CHEF." As a result, the cooking contest complimented their newly-learned skills. Encourage zaniness. We always recommend that brands give participants clear guidelines for a UGC campaign, and Blue Apron went even further by telling customers to "get your friends and family involved — pets, too!" This instruction established the campaign as a fun DIY project, not a high-stakes video shoot, and consumers responded accordingly. They feature their pets, involve their children ("sous chefs"), sip a glass of wine (or two) while they cook, and stumble over the correct pronunciation of crème fraîche. Put a cherry on the sundae. Video submissions have a high bar to entry. 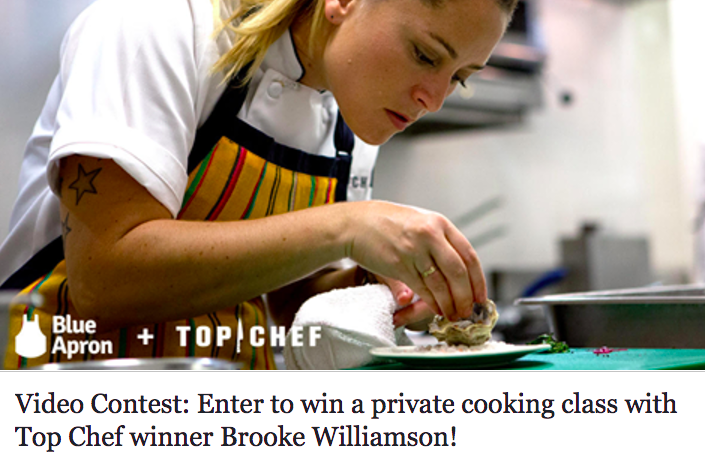 Consumers must plan, choreograph, shoot (and hopefully) edit the content before submitting, so Blue Apron provided a worthy incentive: a private cooking lesson with Brooke Williamson, the winner from season 14, a two-night stay in NYC, and six months free of Blue Apron. By providing a clear script for the video (the recipe card that comes with the ingredients), the brands also eliminated a potential creative barrier. Not every Blue Apron customer will end up working in a Michelin-starred restaurant, but after participating in the Cooking Show Contest, they're one step closer to becoming a celebrity chef.